Warmest greetings from sunny Oban, here in the Western highlands of Scotland! 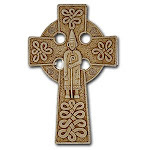 We are a Church of Scotland congregation right here on the coast, leading to the beautiful and sacred Inner Hebridean islands- one of which is the stomping grounds of St. Columba: Iona. I am a Presbyterian (USA) pastor serving as an Associate Minister with the Kilmore Oban Church of Scotland, and my colleague, the Rev. Dugald Cameron (Senior Minister) and I have noticed a trend of many a pilgrim wandering through our doors on any given Sunday, en route to Iona. They are Americans, English, Germans and Kiwis. They're an exasperated Presbyterian pastor on sabbactical, a Church of England prayer group on retreat, or college students from a North Carolina university on a journey. In the past we have given our greetings and offered coffee and the essential buscuit, but we see that there is a real opportunity for a greater vision. We have asked ourselves the question, "how may we extend the right hand of fellowship to our brothers and sisters in Christ from around the world?" Oban is a little place, but it is such a vibrant locale because of the many visitors that mold and shape its character. We at the Kilmore Oban Church don't just want to greet you at coffee, but acknowledge you as a fellow brother and sister on the road. Oban itself has a rich history of Christianity that has been about for millenia; in the nearby town of Kilmore Christians have settled since the 5th century. We have a little prayer room that we dedicated this last February in our Corran Esplanade sanctuary which contains photographs taken by one of our members of holy sites, "thin places" all across Argyll and Bute. Iona is a large part of this, but there are many other sites seeped in the communion of the saints all around us. Our hope is that we can not only be a resource for you, but a soul friend. Whether you are planning an excursion to Iona for sabbatical or taking a group from your congregation, we would love to be a part of the road with you. Perhaps we can show you some of the sacred spaces here in Argyll, or provide for you some quiet time for retreat and prayer on your journey. We are still beginning to envision what our ministry of hospitality will look like, but please don't hestitate to contact us at obancofs@btinternet.com or check out the church's website at www.obanchurch.com. We would love to hear from you.